Type in your site url followed by /wp-admin, and hit 'Enter'. Enter Username and password details in the login screen, and click 'Login'. You are now in the site Dashboard, and you will see a Menu in the black field on the left hand side of your screen, and a smaller menu in the narrow black field at the top of your screen. 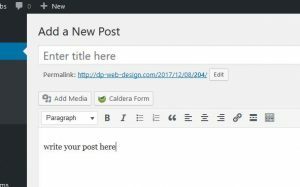 Enter the title of the post in the Title Field; then write the text of your post in the larger field below. 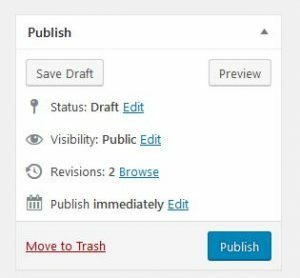 Your WordPress site does regular auto-saves, but you can do a 'save draft' anytime if you are not ready to publish the post, and wish to complete it at a later time. Every post has a category, even if it is 'uncategorised.' 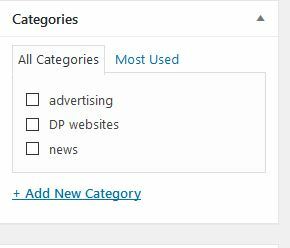 Categories help your site viewers to choose the material they wish to see. You can make new categories any time. Try to choose the simplest and most meaningful you can, depending on what your site is about. You can also have sub-categories, and do edits and re organisation at a later date. Click the box to tick the desired post category. Place your cursor at the point where the media item is to be added, then left click the 'Add Media' button. You will then be directed to the site's Media Library, and choose the required item. More about Media in further addition to this User Guide. Click on the media item to set its position in the post, that is left or right justified, etc. 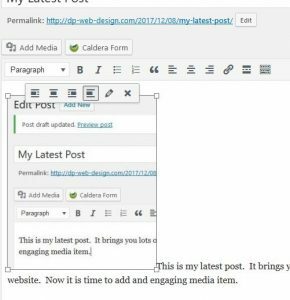 Carry out a Final Preview of your Post. Check for spelling, placement, appearance, etc. 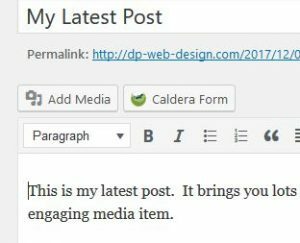 Once you are happy with the appearance of the post, you can publish it immediately by left-clicking on the large 'Publish' buttons, or you can schedule it for a later, or even an earlier date. 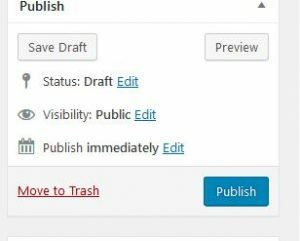 If the post has been published, this can be reversed by using the 'Status' button to change the post to 'Pending', or it can simply be deleted by using the red 'Move to Trash' option.